Just trying to post a picture of my boat. That works;but just now, by looking at it, I discover that I forget to drill 6 holes! On both sides,never noticed that before. Some work to do,I guess. The conning tower casting looks different - when did you build yours? I have noticed a couple of differences in the photos supplied with the kit also. The kit was bought in December 2002 but I started building (I think) in 2005. I don't think the casting of the conning towers differs much because quite a few things you see on the picture were changed or added by me over the years. 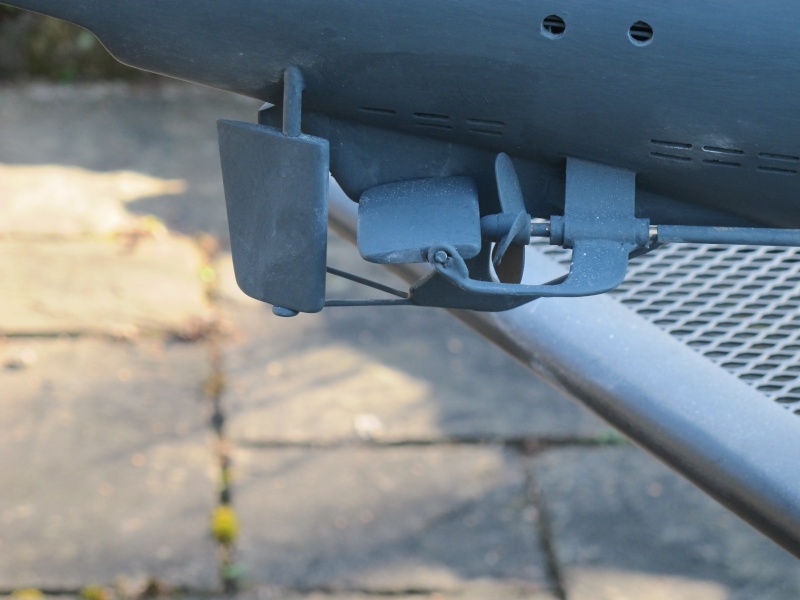 For instance the rear guns are not the originals, the vent grill was not included in the kit but added later on. Also the walking cane (I presume you know the story behind it) was made by myself. The "bulb", down left of the square antenna, was added with the idea of a housing for navigation lights (still not completed). One thing is for sure, my kit did not contain any photo's , just a drawing and a "meagre" instruction. The instructions are still meagre ! and the CD of photos is not that extensive either. 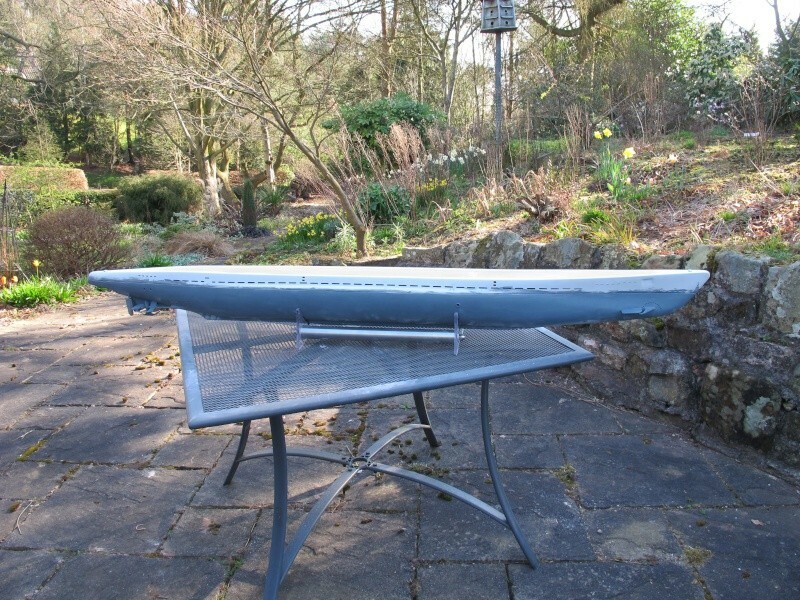 I have a 1/48th scale www.scaleshipyard.com Type IX submarine. 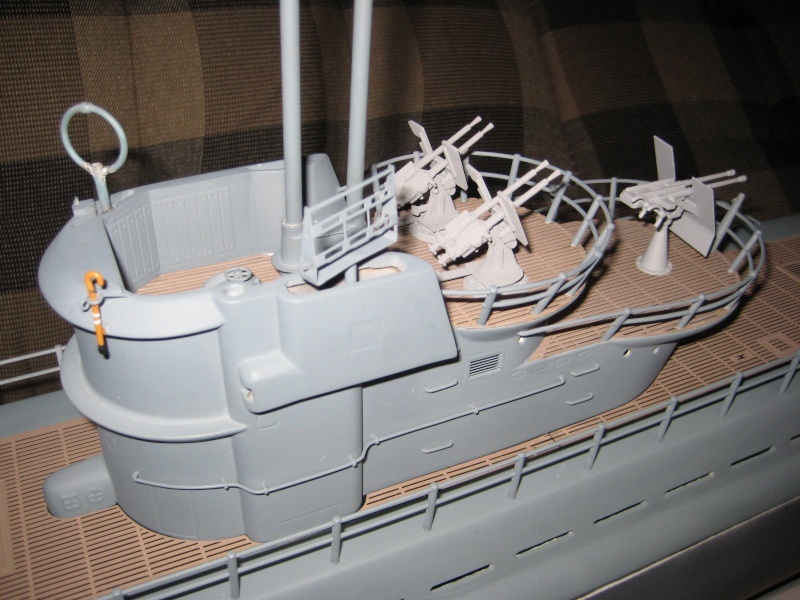 Would the Engel U177 conning tower be close enough in design for my decks? In short the story is as follows: in 1942 U177 went to Bremen for overhaul.During an Allied bomb raid the Officers Quarters were demolished injuring the captain of U177 Robert Gysae seriously on both legs. 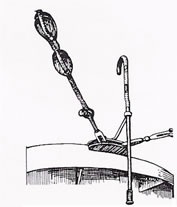 When U177 was ready to sail Gysae come on board limping and using crutches where upon the crew responded enthusiastic and adopted the crutch as an emblem. Instead of painting pennants for every sunken ship they added a white ring on the cane sticking out on the edge of the conning tower. I have a photo and a drawing both will follow later (problem with posting them). Work is progressing slowly - the rudders & planes are getting there but proving a challenge, soldering skills are growing. Did not help when I broke the front plane protector- repair in progress. Hopefully this will be complete over the weekend & I will post some photos. Middle deck bolts now epoxied in place & neoprene gasket has been made. Thanks Rob, looking forward for the pictures! Any progress? Perhaps a picture? Couple of photos attached of rudder area & lower hull painted. One point to note if you use the length of rod specified for the rudder in the instructions it is a little short, I would suggest fitting then trimming to size. Just fitted ballast & deck for the innards. Apologies for my english but "fitted deck for the innards" does that mean that you glued the middledeck into position? I found that a hell of a job and very hard to do this all by yourself. I have the same kit but I am using a polycarbonate tube for the WTC. Nice to follow your build. I'm learning before I start mine. Innards- is the bit in the middle. Plans & instructions do not tally for measurements. I have just started on the electrics. Not being an electrician I am taking it very slowly & anticipate testing outside the hull. does this mean the hull is still complete empty or did you get already something in place: middledeck? supports for the tanks? engines? Supports for tanks & ballast are all in, servos fitted. At present I am soldering wiring on tanks which has gone ok.Next job is to connect ESCs to the motors. The upper deck is planked and the hatches etc fitted but I have rails & bollards to fit. I am swapping between the two at present. Yes. please more photos! I am enjoying your build. It's very quiet here Rob,everything going allright?